Before I get into today’s blog, I just wanted to share that Shaolin has a new resident. I’m not pleased. She moved in next door to Rowan (in Margie’s old spot) and she’s fugly. Well, not as bad as Elise, but she’s pretty gross nonetheless. Yeah that’s right, it’s Bella the Pimple Queen. Blah. Somebody get her some facial cleanser! Anyway, my character Deb has been logging in a bit more often, since King Squirt is still planning on retiring soon. (If only he could find those last few gyroids! And maybe find the UFO… but I’ve decided that shooting Gulliver down is not one of Squirt’s priorities.) Deb, unlike Squirt, still has a lot of stuff to do before her catalog will be complete! Earlier this week, she shot down the wonderous Golden Slingshot. Pond Smelts. And ONLY pond smelts. BOO! So Deb went up and down the river. She only saw small shadows, so of course she cast her fishing line out to them. 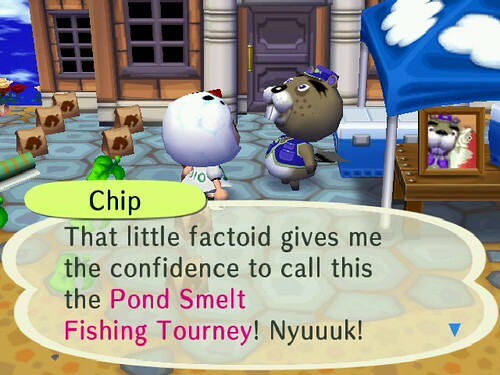 Every time, it was a pond smelt! 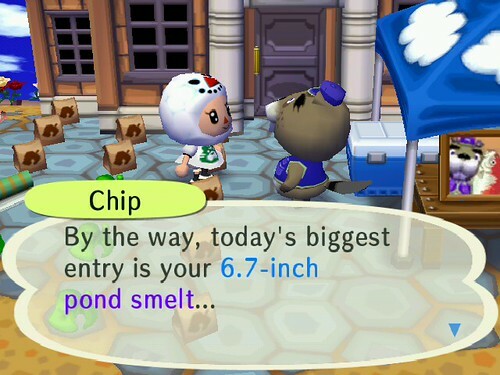 It was like Chip had just brought a bucket full of pond smelts and dumped them in the river. Deb ended up catching 5 pond smelts in a row! She entered them all in the competition, and last I checked, she was winning! In DLC news, nothing really has been announced lately. Sad. The only clue I have is for the next US DLC, which is going to be released for Valentine’s Day. I hope it’s something cute! If I hear any other info, I’ll be sure to post it here! Pippin is the UFO Expert now! 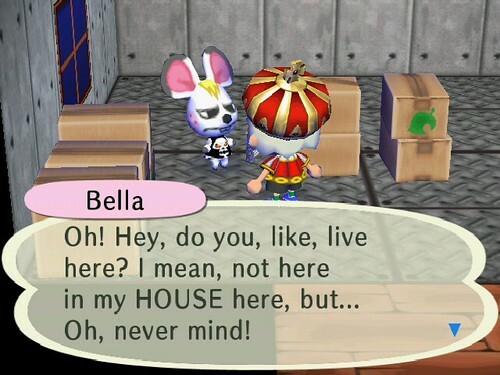 I have not had Bella in any of the three ACs yet. She is a site for sure! I love your pic for the golden balloons and golden slingshot, the balloons look so cool. 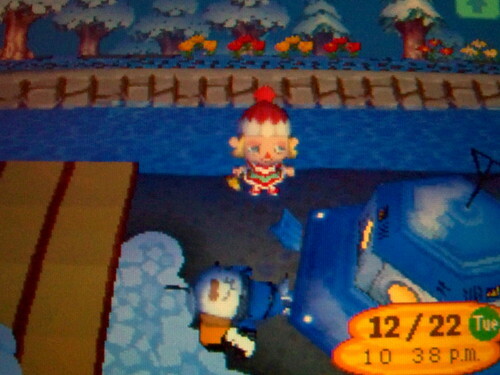 I had a horse mackerel fish tourney in Sparta today, I only went to the city, placed an 18000 bid on a snowman clock, bought a painting from Redd, and got “Two Days Ago” from KK tonight. 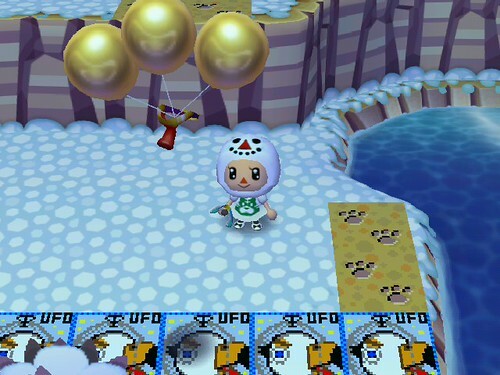 I also shot down the UFO once in my WW town Painvill… I have yet to see it in City Folk. Aw I think Bella is kind of cute!….in a “unique” kind of way.